Dr. Robert Edwards was born and raised in Atlanta, GA. He graduated form the University of Georgia in 1976 with a degree in Biology. He obtained his DDS degree from Emory University School of Dentistry in 1981. After practicing in Atlanta for two years, Dr. Edwards opened his practice in Rome in 1983. He is an active member of the American Dental Association, Georgia Dental Association, Academy of General Dentistry, and the Floyd County Dental Society. Dr. Edwards volunteers at the Free Clinic of Rome performing dental treatment to the less fortunate in the community. He is a member of First Presbyterian Church of Rome. Dr. Edwards is married to Frances and they have three grown children Rebecca, Hunter, and Will. In his spare time Dr. Edwards enjoys mountain biking, kayaking, hunting, and fishing. Dr. Hunter Edwards was born and raised in Rome, GA. After graduating from the University of Georgia in 2008, he attended The Medical College of Georgia, school of Dental Medicine, where he obtained his D.M.D degree in 2012. Dr Edwards then completed a one-year Advanced Education in General Dentistry through the University of Alabama at Birmingham. Through this program, Dr. Edwards received additional training in placement of dental implants, oral surgery, advanced prosthodontics, conscious sedation, and management of the medically compromised patient. Dr. Hunter Edwards joined his father’s practice of Edwards Family Dentistry in July of 2013. When he is not seeing patients, Dr. Edwards enjoys spending time with his wife, white water kayaking, hunting, fly fishing, riding bikes, and being outside. Carol lives in Centre, Alabama. She joined our practice in July 2013 and had worked in general dentistry in the front office for over 13 years. Carol loves working with people and working with their financial needs. Carol is married to Michael and they have a daughter, Kara-Beth and a son, Joshua. In Carol’s spare time she enjoys camping, riding the motorcycle with her husband and having fun with family and friends. 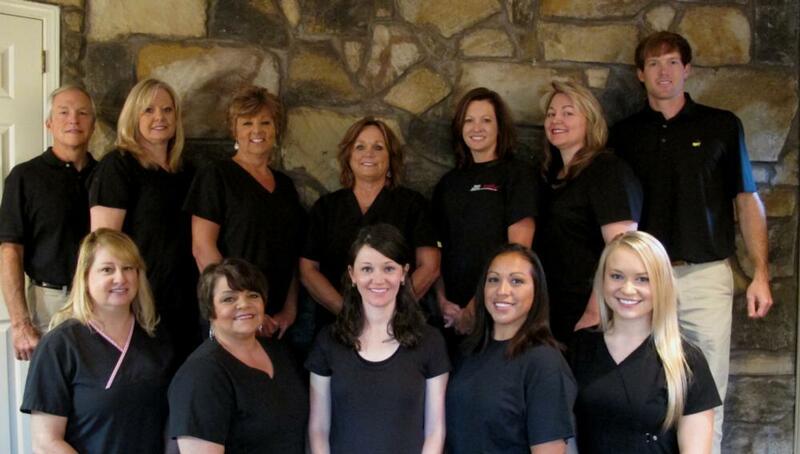 Wanda joined Edwards Family Dentistry in 2000. She has seventeen years of dental experience. She is proficient with both assisting and front office duties. She loves meeting and talking with new people. She also cares deeply about helping them with their dental care, as well as their financial needs. Wanda is married to Kevin Lane. They are the owners of Lane Concrete. They have three children, James Barnette, Jayna Barnette, and Skylar Moore. They also have two grandchildren, Jimmy and Desi, with little Judson on the way in November. Wanda enjoys spending time with family, painting, gardening, decorating, and cooking. Ann joined Edwards Family Dentistry in November 2015. She brings over 20 years of dental experience to our practice. Ann’s background is in accounting and banking but she developed such a wonderful relationship with her family dental office that she went to work for them. Dentistry became a career for her. She loves helping patients feel welcome and comfortable with their dental experience. Ann is married to John Allred and they have two wonderful children. Tammy Dempsey is a dental assistant with Edwards Family Dentistry. She has been employed by Dr. Edwards for 25 years. She has been instrumental in the growth of the dental practice. She has enjoyed being part of the lives of several generations of patients that have trusted Dr. Edwards with their dental needs. She has two children and lives in Alabama. Sharon McFall joined Dr. Edward’s team in 2011. She has 20 years experience as a chair-side assistant. She has really enjoyed getting to know the patients and their families over the years, as well as assisting in their dental care needs. She enjoys spending time with her family and being outdoors. She is married and has 2 children and 2 grandchildren. She resides in Cedartown. Lupita joined Edwards Family Dentistry in 2016. She brings over 10 years experience in dental assisting to our practice. Lupita is bilingual and enjoys meeting new patients. She is also a member of Georgia National Guard. Lupita enjoys doing outdoor activities with her family, such as biking, hiking, and sky diving. Jennifer Thompson graduated from the Medical College of Georgia with a degree in dental hygiene in 1995. She has been part of the lives of our patients and their families for over 15 years. Jennifer participates every year in continuing her education, to keep up with the most current information and treatment options, to give her patients the best care possible. Jennifer is married to Jeff Thompson, and has two sons, Cade and Cason. In her spare time, she enjoys sewing, crafting, and camping. She resides in Silver Creek. Emmylou Ivey graduated from Georgia Highlands College with a degree in dental hygiene in 2008. She has been part of Dr. Edwards’ dental team as a dental hygienist since 2008. She enjoys meeting new patients every day and getting to know the families of those who have been coming to Dr. Edwards’ practice for over thirty years. As a hygienist, she does cleanings and discusses other treatment options for the patients such as bleaching, cosmetic, and restorative work. Emmylou is married to Corey Ivey and lives in Alabama. She enjoys church activities, camping, gardening, and spending time with family. Kristen joined Edwards Family Dentistry in 2004. She graduated from the Medical College of Georgia in 1998 with an Associate of Science Degree. Kristen is married to Brandon Ekey and they have 2 daughters, Samantha and Sarah. They are active members of Pleasant Valley South Baptist Church. The Ekey’s enjoy outdoor activities, watching their girls playing soccer, and spending time with family and friends. Kristen feels it is important to have a personal relationship with her patients. She feels it is important to educate her patients as to all of their treatment options, so they can make the best decision for their dental needs in order to obtain optimal dental health. Kristian Roberts graduated from Georgia Highlands College with a degree in dental hygiene in 2016. She has been a part of Edwards Family Dentistry as a dental hygienist ever since. Prior to her degree, Kristian had worked as a dental assistant with Dr. Edwards for several years. She is enjoying the evolution of her relationship with patients as she has moved into her new role. Kristian is married to Austin Roberts. They enjoy spending time with family and friends.